Vince Parolin, general manager at Art Magic Carpentry. 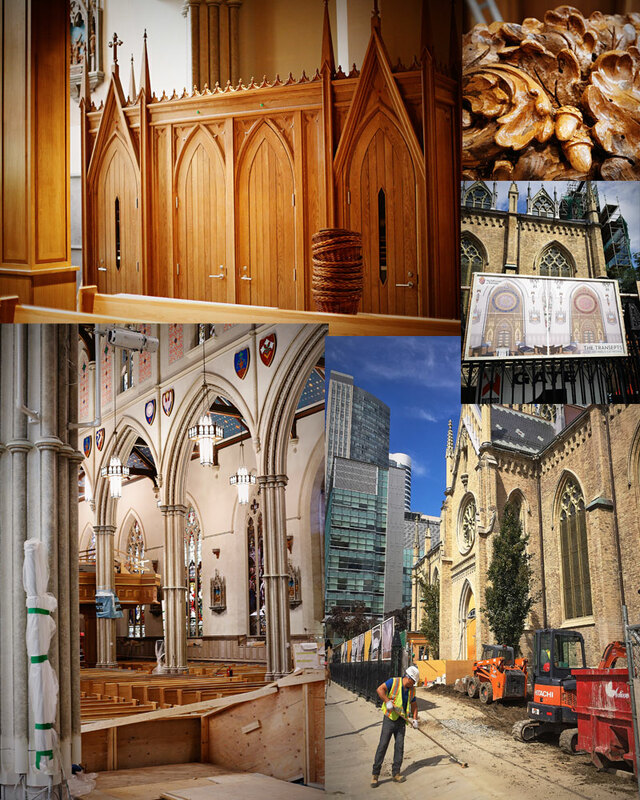 St. Michael’s Cathedral, the cathedral church of the Roman Catholic Archdiocese of Toronto and the principal church of Canada’s largest English-speaking Catholic archdiocese, has been undergoing a massive, $130-million restoration and we were able to take an early look inside. Thanks to Vince Parolin, general manager of Art Magic Carpentry, one of the companies playing a big part in this “once of a lifetime project,” Woodworking Canada had a chance for a look behind the scene and some insight into what it takes to complete such an important and “very special” project. 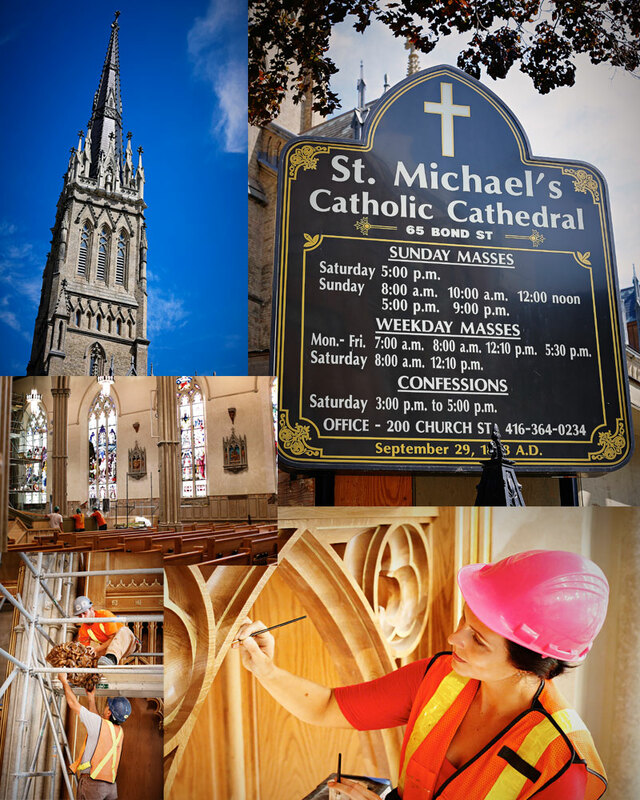 St. Michael’s Cathedral is an iconic building in downtown Toronto and restoring it is restoring an important piece of Toronto’s and Canada’s history. One of the oldest churches in Canada, and a prime example of the English Gothic Revival style of architecture, St. Michael’s Cathedral was originally constructed by William Thomas in 1845-1848 to serve the growing Roman Catholic population of Toronto. Over the years there have been additions and many repairs and updates, but this is the first true restoration of the church and to say it was a lot of work is an understatement. Canadian-owned Buttcon Ltd., a 100% employee-owned Canadian company with decades of experience and an impressive resume of successfully completed projects, is looking after managing the renovation and the project’s general contractor. +VG Architects is the lead consultant and architect for the project. It is also one of their most ambitious projects, not just because of the scope and nature of the work, but also because of the fact that they are dealing with such an iconic and important building. Volpe says there have been many repairs to the structure over the past 150 years and often parishioners; carpenters or stonemasons who patched things up in their spare time carried them out. However, that is not how things are done today and as a result the company had to look at everything and make it right so that the cathedral will last for the next 100 years. According to Buttcon, the project involves the historical restoration of the 157-year-old Gothic cathedral and includes the crypt basement, which involved the transformation of the existing sub-grade level crawl space into a new, usable full-height basement. Also, the west facade masonry restoration, which includes the repainting and cleaning of the existing masonry, supply and installation of new stone pinnacles, finials, cornices, balustrades and niches including new steel and concrete support structure, and a new wood structure and cooper roofing. The narthex restoration and renovations included the demolition of existing west entrance interior finishes including new slate floors and wall treatments, new holy water fonts, new steel and glass stairs pass through the narthex from the basement level on their way to the balcony level and a new elevator from the basement level to the balcony level. Then there is the new atrium, all-new mechanical systems and much, much more. And being the historic building that it is, there were many challenges along the way. Among them the discovery — with much of the structural work as well as a lot of interior finishing nearing completion — that some of the main support columns’ old bricks and mortar were cracking and crumbling making for unsafe conditions. However, with most of the big challenges now behind them, the project is well on its way for completion this fall. Vince Parolin is the general manager at Art Magic Carpentry and his company has a major role in the renovations. Not surprising really since Art Magic Carpentry has been a leading supplier of woodworking products and services — including rough carpentry, finished millwork, restoration work, and construction for major industrial, commercial, and institutional projects in Southern Ontario — since 1973. Parolin, an architectural technologist, AWMAC member and its former president, says the company has worked on many beautiful, impressive and well-known projects, but this was something else, something very special. “We have done a lot of beautiful projects, but this is special. It is very, very special to do this work for the church,” he says. “And it was great working with all the people there, everybody involved with the job had a common goal, and everybody came together. Art Magic did most of the woodwork you will see inside the renovated cathedral with the exception of the pews and the balcony. From the narthex, the nave and numerous ceilings, to the new atrium and priest and working sacristy, cabinetry and confessionals, doors and doorframes and general and miscellaneous interior work. Then there were new lunchrooms, security rooms and washrooms and lots and lots of general carpentry. The project also involved a lot of carving and gold leafing. “That is not something we do so we subcontracted the carving to Art for Everyday, they have a lot of experience and did a great job,” Parolin says. Manoo Mahmoodi of Art For Everyday says being part of that project was very rewarding and a great experience for everyone at the company. “They hired us to do all the carvings for the project and it’s something that we’ve been working on for about 10 months,” he says. “We used white oak exclusively and we’ve had great feedback from the project managers, so we would like to do more of that in the future,” he says. Abbas Ghassemi, Art For Everyday’s VP sales and marketing, likened the work they did to a puzzle. 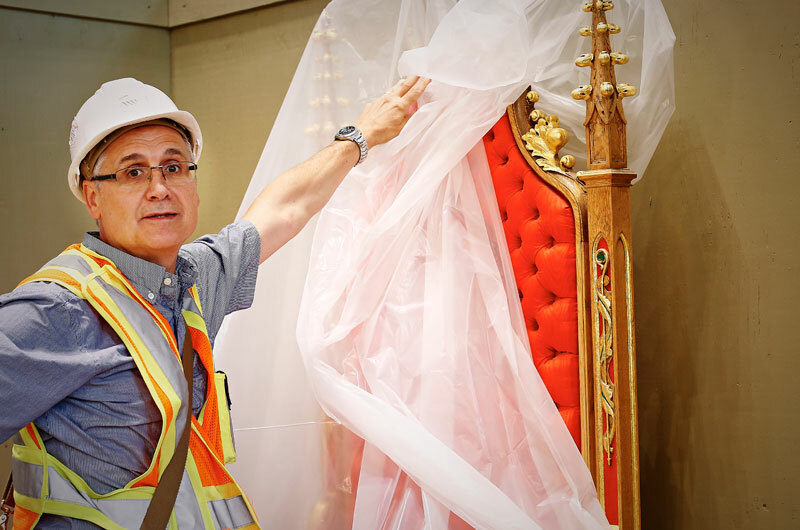 “We carved a lot of different pieces, some were being designed and redesigned with the project leaders as the work was being completed, which made it challenging,” Ghassemi says. Work started in 2012, and Parolin says the main portion of the cathedral will reopen at the end of September, however some of their work will continue until the end of November. Most of the material used is solid white oak. Some larger pieces that required laminating were done in lumber core with veneer because it is a long-lasting product. Parolin says it was a difficult product to source, and he knows only one company in Montreal that still manufactures it. “But we wanted this because we are building it for a 100 years, we are not building for a two-year warranty.